A different view of Ocean Harbour,this time, looking over the gray sand spit. 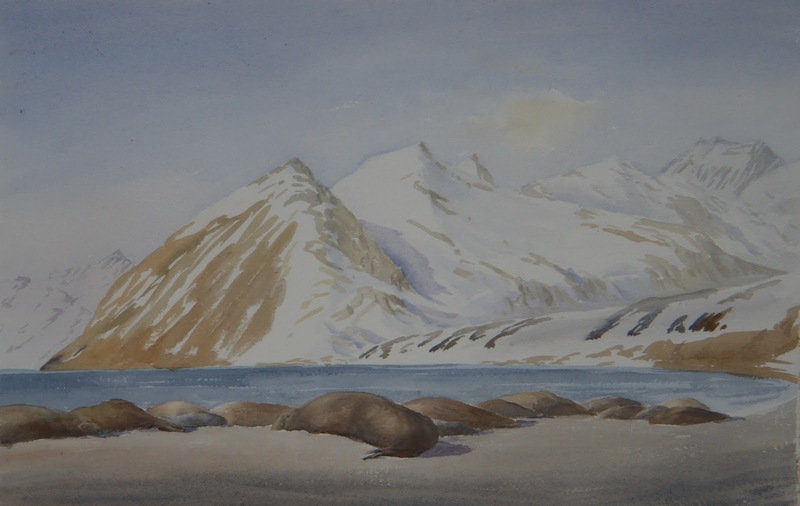 I'm not entirely happy with the elephant seal representation, but it is the first attempt at a group of them so I will persevere with this; it's hard to get a view on South Georgia without a group of them in the foreground. 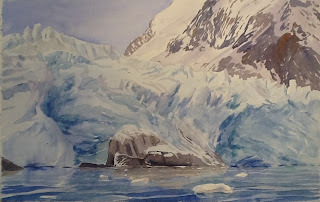 A Zodiac cruise along the snout of the glacier at the head of King Haakon Bay gave me a chance to sketch the basic forms; it took a bit of experimentation to try to capture the intense blue-greens that appear to emanate from a light source within the glacier itself. a first try, I'm keen to return to this subject and play around a bit more with the colours. This was a fairly clean glacier, but others have various bands of earth colours running through them. I'm not sure of the origin of these bands, any glaciologist reading this is welcome to provide an explanation. 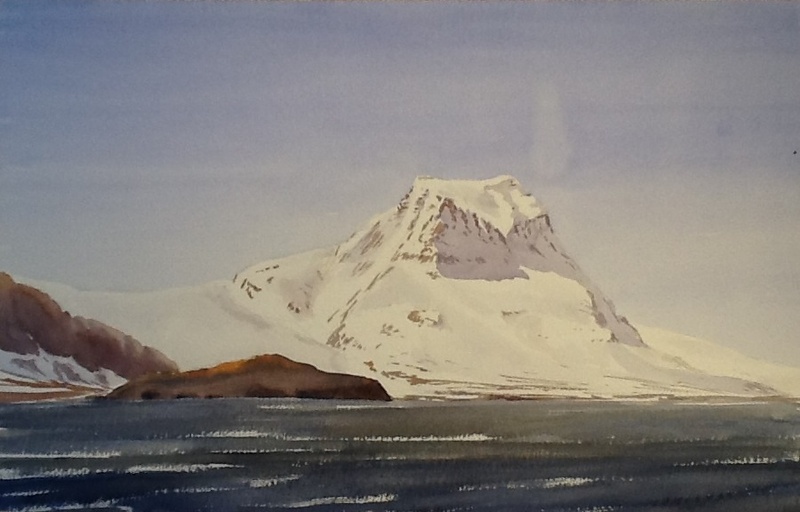 On arches 300gsm rough paper again, 22x15"
A cold overcast morning gave way to brilliant sunshine and the view from the Zodiacs returning to the ship was magnificent. Peggotty Bluff is where Shackleton's party landed after resting at Cave Cove, and some of them began the trek over the island to Stromness. The route taken was, if I recall correctly, to the left of the prominent peak. I can't find a name for this on the map, which reflects the sheer number of impressive mountains South Georgia has. A very early (5 am) start as the ship was anchored in Fortuna Bay. 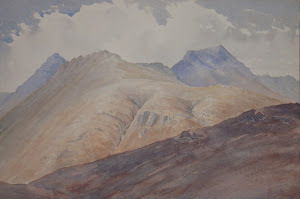 The sky was changing rapidly, with thick mist giving way to patchy sunshine and cloud. I made a couple of quick sketches, and have just finished a half-imperial (21 x14") painting on 300gsm Arches rough paper. 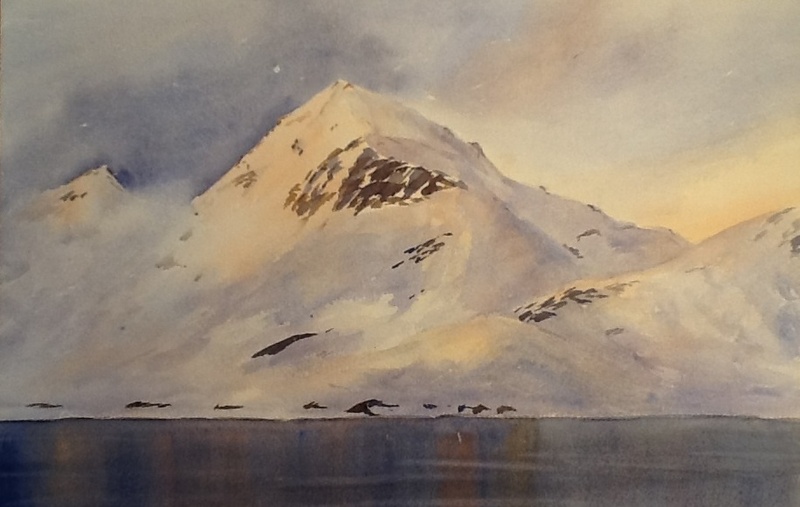 I tried boldness with the sunlit slope colour; at first I didn't like the result, so washed it off and applied more layers. 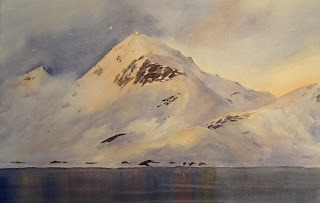 We were waiting for the ski traverse team to descend to Fortuna Bay, just as Shackleton's crew had done a hundred years earlier.